Chrome 97s. 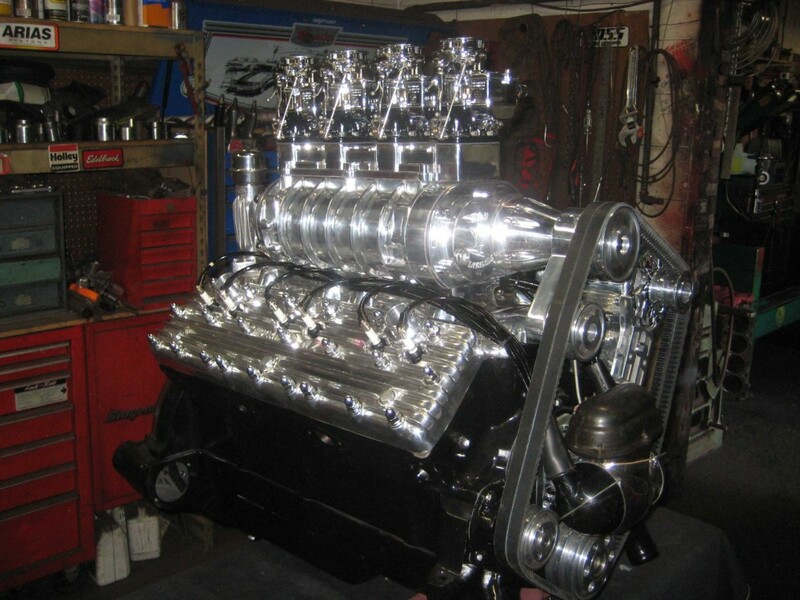 Blown Lincoln V12! Stromberg dealer, Mike Herman at H&H Flatheads really came up with the goods this time! Not a lot to say to plenty to look at. A supercharged Lincoln V12 flathead motor with four new chrome Genuine Stromberg 97s on a very special blower plate made by Mike at H&H. Check out the adapter then listen to it roar! You can find H&H Flatheads via our dealer network button at the top of the page. First off, we better remind everyone that a 6×2 system is no place for worn out old 97s. You need good reliable carburetors with good fuel metering, no play in the shafts and no air or fuel leaks. Six air leakers is a problem for good idle. Six fuel leakers is a problem for your personal safety. Racing. If you’re genuinely using six 97s to go racing then it’s simple. Buy a Stromberg 6×2 direct linkage. And set the pedal link to open all six at the same time – quickly. On the street. OK, so what about the 6×2 linkage in your grocery-getter? The truth is, we can’t give you a definitive answer for every application. But we can say that, whatever you do, you’re probably going to look at a linkage based around two Stromberg TwoStep 3×2 progressive linkages, plus a Back-bar kit to join the two banks of carburetors together. Linkage installation instructions can be downloaded at our Tech Center, of course. Let’s look at some basic principles and remind you that all Stromberg progressive linkages are hugely flexible in operation, so you can tune it for many different outcomes. One setting does not fit all applications, and the weight of the car, gearing and rearend ratios, engine tune and drivability, your favored freeway cruising speed, and more, can all play a part. Pedal response. As a rule, you want smooth throttle operation with a slow pedal ratio, ie. you push the pedal further for a set response at the carburetors. Do the opposite and the throttle becomes like an on/off switch, which is no fun on the street. Now, your pedal ratio and travel are probably fixed, so being able to change things at the linkage end is important. There are three adjustment holes at the top of the long back bar levers. And if you link your pedal to the highest hole and set the link to the carbs in the lowest hole, you will get the slower throttle response. The opposite is true of course, if you find you are bottoming out your pedal before you hit WOT and you need faster response at the carburetor end of the linkage. Remember, of course, that you must never hit Wide Open Throttle (WOT) with any pedal travel left to go, as forcing the pedal further could damage the linkage, stress all the links and, worse, break it and leave your motor uncontrolled. Four carbs working. Here’s the next thing to think about. Just because you have six 97s on the manifold, it doesn’t mean you have to use them all. One option is to use our 29447K Blank-off plate kit under the center carbs on each bank (remembering to use a gasket above and below the plate) and blank off the fuel to them too, keeping the outer four operational. So it looks like a 6×2, but operates like a 4×2. You’d keep one carb pretty much over each set of intake ports. Plus you’d be looking at 4x162cfm = 648cfm – enough to run a 350 Chevy and rev any older motor well beyond its comfort zone. You could run a Stromberg 6×2 direct linkage opening the four outers together, or you could hedge your bets and go for the progressive option in case you ever change your mind on the center carburetors. 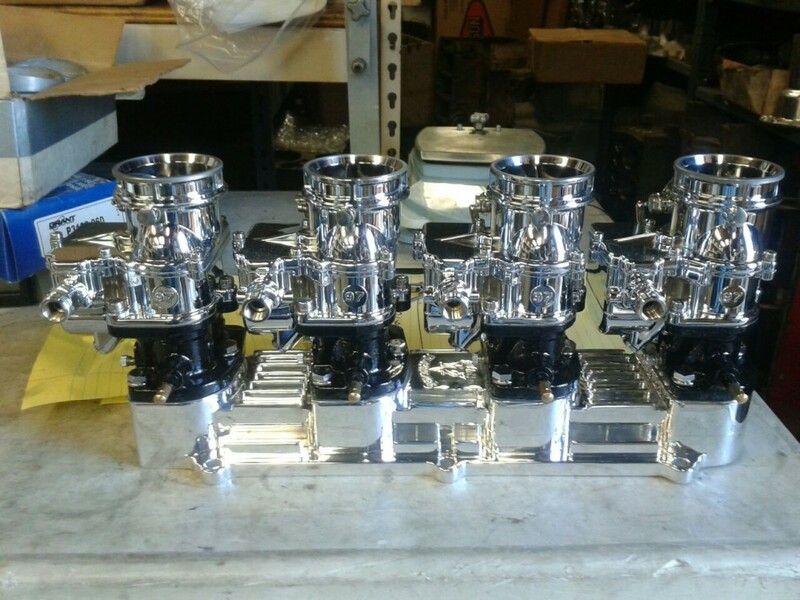 The 3×2 progressive on each bank can be set up so it pulls the outer carbs from idle. Six carbs working. Ok, so you want the full 6×2 street experience? Let’s talk about linkage adjustment. 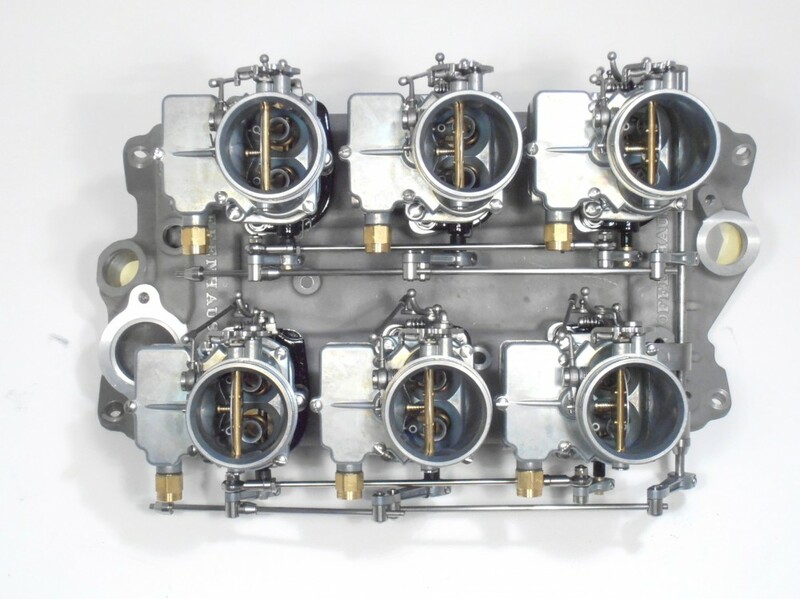 With the progressive sliding links on the top adjustment holes in the center carburetor levers, and the sliding stops adjusted so that all three carbs on each bank reach Wide Open Throttle (WOT) at the same time, the system will run on the center two carburetors from idle, bringing the outer carburetors in from around 50% throttle. On a 3×2 you have a a lot of versatility on bringing the outer carbs in earlier or later, but on a 6×2, it’s not that easy because the slider rod MUST be attached to the top hole in the long center lever because the bottom hole is taken by the link to the back-bar. And if you swap them, those back-bar links hit the back carb fuel inlet. Even then, we’re not completely out of the woods. On a 6×2 progressive linkage, the sliding rods on each bank must join to the front carburetors. They cannot join to the back carbs (as you would usually with a 3×2) because of clearance issues with the back-bar. Why is that a problem? Because on a front-facing 3×2 progressive, with the sliding rod in the top adjustment hole, that sliding rod will rub on the underside of the center carburetor hose (if you use traditional fuel hoses). The good news, though, is that we offer a special fitting to help you out. 9080K-E, our extended Superseat hose fitting, moves the hose and clamp further out a little to leave a gap for the sliding rod to clear. Check out the pictures on our website. You may have seen pics of old school 6×2 progressives with slider rods bent like a big L shape to miss that center carb fuel inlet. Use a 9080K-E and bendy rods are history. Warning! ….Do not use the linkage in any configuration that will cause sticking and binding, which could result in uncontrolled engine speed, property damage, serious personal injury or death. Return springs. Make sure all six carburetors snap shut when you lift off at the pedal. We mean it! All Stromberg linkage kits are supplied with our Snapback torsion throttle return springs. They’re almost invisible. They work great and you can get more from your Stromberg dealer (ask for 9154K). Remember you already have the accelerator pump springs helping return the throttle so you shouldn’t need a crazy number of springs. If there is any slowness in the throttle return it is probably at the pedal end or because your swivels are misaligned. Eye the system from above and adjust the levers along the throttle shaft or Back-bar as required. Jetting. We cover jetting in other How-to’s and the message is the same for a 6×2 system as any other. With engine tune, elevation, local gas laws, ethanol content and more all having a bearing, each application will be different, so it’s almost impossible for us to estimate what you need. So we usually say start with the standard 0.45 mains that Stromberg 97s come with and see how it works from there. Though as a rule you’ll probably need small power valves – nearer the number 71 mark. Just remember, the main jets come in almost immediately off idle and control the fuel air mixture at cruise speeds. Once you get past around half throttle, the power valves join the party. The power valve controls the amount of enrichment at higher revs. While it does pass through the power valve, the volume of accelerator pump ‘squirt’ is not really dictated by it. In tuning, you might want to try disconnecting some of the accelerator pump lever links (like all outer four at first) to test reducing that top end enrichment and also the amount of at raw gas injected when you pump the throttle. Remember, most 6×2 intakes were designed for racing at full throttle. If you crawl around town and rev it at the lights, you will get wet fuel in the bottom of the intake. As always, getting the car/engine onto a dyno of some sort will help you measure what is happening and make informed decisions about tuning. One small tip: Once the linkage is set-up, it is often easier to leave it in place and remove the carburetor bowls off the bases to change jets. Keep persevering and you will find a good level of tune that suits your engine and your driving style. Your link to the pedal. We have said this before, but it’s worth repeating. Stromberg recommends a mechanical pedal link for all multi-carb systems. Ideally, your 6×2 Back-bar can be connected to the pedal via one of the long levers that work the two banks of carburetors. But if these don’t line up with your pedal link, you can add a third long lever to the Back-bar shaft with Stromberg kit 9096K (Long linkage arm/swivel) positioned to align with your throttle pedal ‘pull’ point. You can download this How-to at the Stromberg Tech Center (click the link). As with all our Tech articles, we welcome customer feedback and other input. Add a comment right here, or email us (tech@stromberg­-97.com) with your thoughts and if it adds to the debate, we’ll add it in. 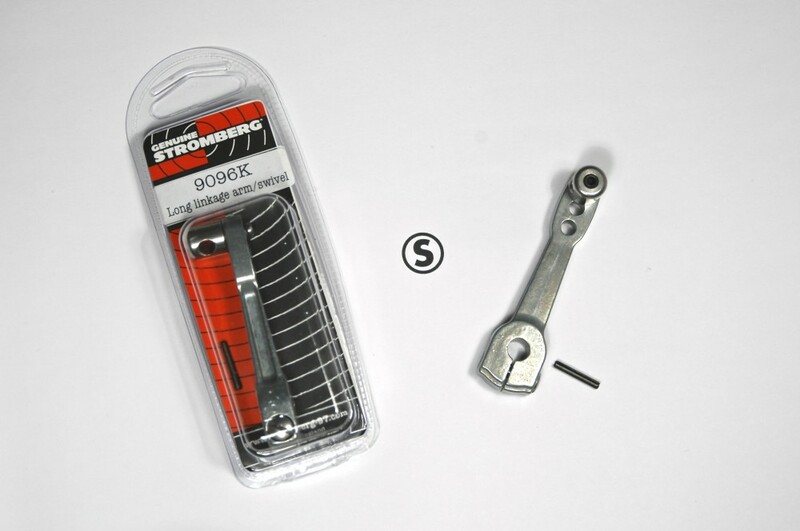 Stromberg 9090K and 9091K short linkage levers have been around for a while now, so it’s about time we made our long lever available separately too. Designed to match the shorter Superlink lever arms, 9096K is also zinc die-cast with a modern H-beam section for high strength without excess weight. The countersunk stainless steel screw matches those on the carburetor and threads directly into the arm for serious grip. And the stainless steel swivel is secured by a small e-clip, with a 3/16th diameter cross hole for the linkage rod and a black knurled-tip set screw. There are three adjustment/connecting holes in this lever (with 2 1/4inch between centres to the top hole) so you can move the swivel to change your linkage leverage and pedal/throttle response. These arms are the foundation of all our 3×2 TwoStep progressive linkages, of course. But if you’re adding this kit to your 4×2 or 6×2 Stromberg Back-bar kit, you’ll be pleased to know that we also include a 3/32” roll pin, so it can be drilled and pinned to the shaft for an even more positive location. We always recommend a mechanical pedal link for all multi-carb linkage systems, so if the long levers working the two banks of carburetors don’t line up with your existing pedal link, 9096K can be threaded onto the Back-bar shaft and positioned to align perfectly with your throttle pedal ‘pull’ point. One more thing. Looking for this type of lever arm for a 3×2, but need something to pull your transmission kickdown cable? Stay tuned. They’re looking cool, and in tooling now. For price and more info, please click 9096K to go to our linkage products web page.